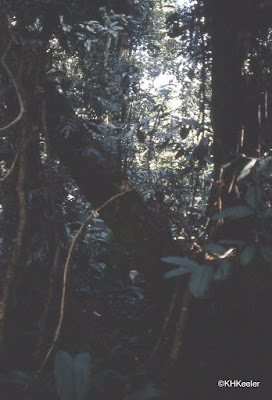 I grew up in suburbia, it was love of plant ecology that drew me into strange activities like a week's trek in the rainforest. 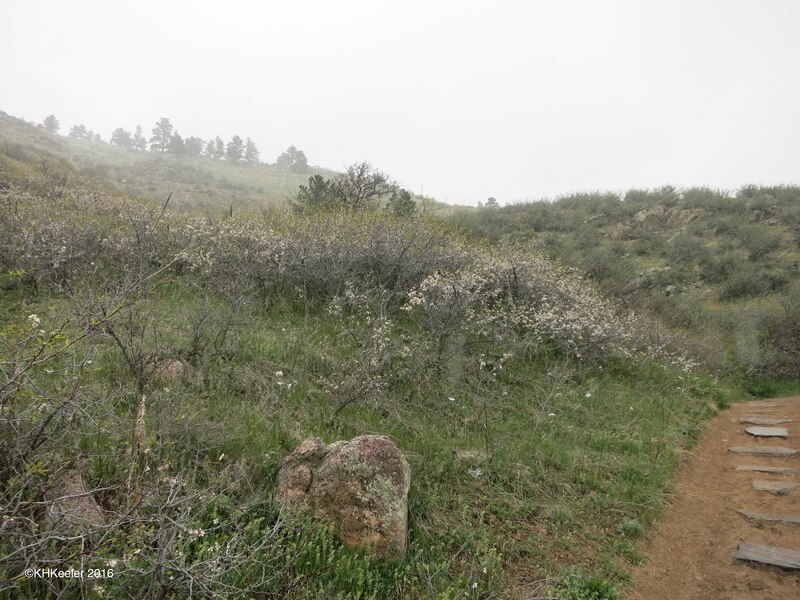 You hike the trail casually glancing into the brush and then, ooh! a bright blue spike of flowers catches the eye! Larkspur! For me, larkspurs are one of the wildflower treats of spring. 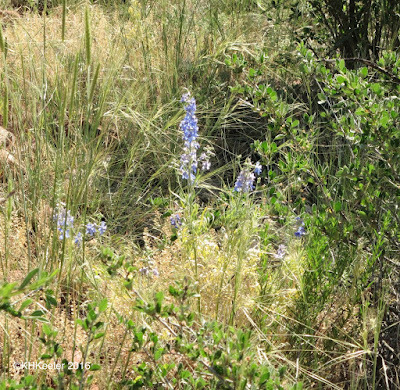 Common enough that you see them, not common enough that you go "oh, just a larkspur." 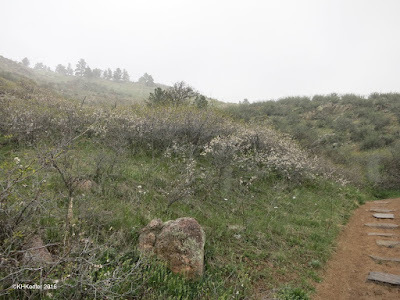 Five days later (see last week's blog) I revisited Horsetooth Waterfall Trail, this time on a sunny morning after three days of warm weather. Flowers that close in cold weather were open! April 28. 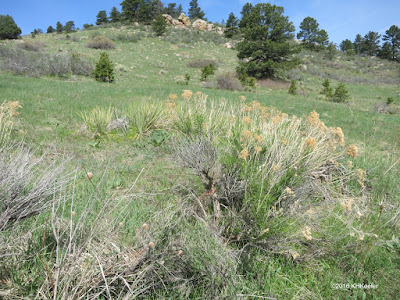 I needed to check out the trailside plants of Horsetooth Mountain Park, on the west side of Fort Collins Colorado, for a plant hike I was going to lead the next weekend. When I got there it was snowing. Lightly, mixed with sleet, but persistently. One of the things I learned as a prairie ecologist: "do it now, the weather later may be worse." Hiking out in the sleet/snow was cool but not unpleasant and I knew the weather forecast was for snow for the next three days. Out I went! Being in the Southern Hemisphere, the northern end of Australia is the warmest. In the lands east of Darwin on the northern coast, there is monsoon forest. 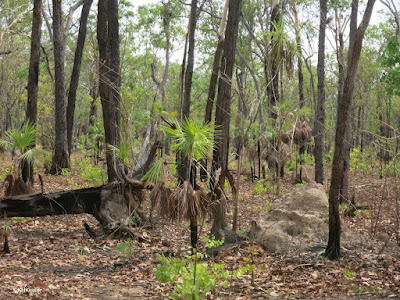 A distinctly Australian tropical forest, very dry part of the year, alternating with periods so wet the low spots all become lakes and the roads disappear. Kakadu National Park preserves a big part of that region for visitors to marvel at. It is the world's second largest national park and a World Heritage site (for both culture and nature), protecting a complex and diverse place.